The UK first introduced its 999 service in 1937. Over the next 75 years telecommunications has been totally transformed but the emergency telephone call has hardly changed. A new IET initiative has called for a complete re-think of the emergency ‘999’ call service to move it into a voice plus data world and for consideration of an emergency text service. There is a huge opportunity to vastly improve the experience of emergency calls that exploits the amazing technical advances of the past few decades…the IET initiative is a timely wake-up call. The broadband Internet is unleashing huge efficiency gains in just about every corner of our lives and the smartphone provides the capability to deliver this on a personalised basis wherever we are. It is ironic that the very same smartphone has actually made it slightly more difficult to make an emergency call. 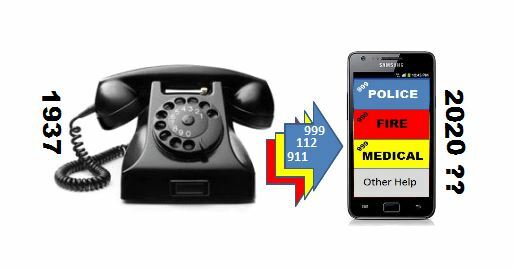 Instead of just four key-strokes (999 plus pressing the send key) the smartphone has typically doubled the number of actions to make a 999 call. We have to press a button to wake-up the phone from standby, a swipe to activate the screen, another tap to get the phone function running and another to make a key-board appear. We then dial our 999 (or 112 or 911 depending where we are in the world) plus send and our call arrives at a switch-board manned by a human being whose main function appears to be to re-route our call to where it really needed to go in the first place. Then follows a verbal clash between the caller blurting out the problem and the control room operator first wanting to know who we are and where we are. The next part of the call can be simple or quite excruciating if the emergency is complicated to explain. Throw in the occasional language barrier, poor signal quality or high background ambient noise and this sums up broadly where we are today. It sort of works most of the time but the experience for the public could be a whole lot better and there are significant efficiency gains possible for the emergency services. Clean-up the key-strokes and get rid of the intermediate switch-board – The need for the intermediate switch-board was mainly to allow the simplicity of a single emergency call number. But the modern smartphone can display our choice of police, fire and medical emergency without the need to type in any numbers. Touch “police” on a standardised menu and the phone can work out the rest including the right number for whatever country we are in. Send a data message of our personal details in parallel with connecting the call – Our smartphones are personal to us and know who we are and where we are. We can store other data relevant to an emergency call. All this could be up on the screen in front of the control room operator in an instant. This will cut out the dialogue of identifying who we are and where we are. Our location is sometimes not obvious to us if we are in a strange place. Having this information instantly on their screen allows the operator to address us by name that can calm a tense situation. Allow the emergency operator to take over our smartphone camera – One picture is worth a thousand words. When we make an emergency call we should explicitly be giving permission to the emergency services to extract the real-time still or moving images our phone camera is pointing to without any further action on our part. With an image of what is going on the emergency controller is much better place to react to our needs including which services need to be deployed.. The fire service knows whether to send one appliance or several. An accurate picture of an accident to a child would allow the controller to talk us through the very best first aid over the smartphone (a two-way video link) and not have to await the arrival of an ambulance. An assailant knowing their picture has already been received in the police control room might think twice before turning a threat into grievous bodily harm. The police arriving to help would also be better prepared with an advanced picture of a situation. This proposal raises privacy issues but it is not an option that can sensibly depend upon setting-up permissions in the heat of the moment. But users certainly need to be in control via some form of prior opt-in. The modernized emergency call process should allow for text messages – There are situations where a text message might be better than a voice call in an emergency for example where there is high ambient background noise or where a voice call to the police might exacerbate a threat. A text message is also much superior where language barriers exist as automatic translation is now so well advanced for the written word. Easy transition to urgent but non-emergency calls – A well organised screen menu for emergency calls should be able to lead a user very easily to a “second screen” providing for the urgent non-emergency calls such as the recently introduced 101 number to the local police station or the terrorist hot line. It is probably this second screen where the text based emergency calls could be teed-off from so that the normal emergency call process is not made more complicated with extra choices. This layered screen approach is perhaps getting into too much into the detail but I mention it to bring out the potential commercial opportunity of a “third screen” for other pressing needs of users such as plumbers, drain clearance etc with its advertising potential to help mobile operators pay for the investment needed in the modernizing the necessary parts of the mobile networks. Having some good ideas is the easy bit and getting the smartphone suppliers/Apps providers to react is likely to be fairly straight forward. The hard bits will be to standardise it and keep it exceptionally simple to use. Standardisation is absolutely essential so that users can pick-up any smart phone and the process, look and feel are absolutely identical. This will allow the education of the very young and old on the one way of making the modernised emergency calls and give them the confidence to use the service under the stress of an emergency. It will be a big challenge to modernize all the back-office functions from the mobile operators to emergency services control rooms. A new system must also be designed to sit seamlessly alongside the old and in no way detract from it. All of that will take time. It may take five years but that five years begins from a decision to do something. So the urgency is to get engagement and attention of the relevant policy makers. The prize is enormous and this IET initiative deserves our support. A good target date would be to modernize all of Europe’s emergency calls by 2020 which offers a neat “informal” tie-in with the introduction of 5G with its enhanced capacity for video, low latency and demand attentiveness. We should set high ambitions…a modernized emergency call service should work right across Europe and why not the world? You are currently reading "Time to modernise emergency calls"